The Industrial IoT (IIoT) gateway from Moxa connects geographically dispersed devices to the cloud. Especially in outdoor or rugged environments that are common in smart city, civil infrastructure, and industrial automation applications. The UC-8200 industrial computing platform is designed for embedded data acquisition applications. The computer comes with one CAN port, dual EIA-232/422/485 serial ports, and dual 10/100/1000 Mbit/s Ethernet ports, as well as dual Mini PCIe socket to support Wi-Fi/cellular modules. These capabilities let users efficiently adapt the device to a variety of communications solutions. The product is built around an Arm Cortex-A7 dual core processor that has been optimized for use in energy monitoring systems, but is applicable to a variety of industrial solutions. With interfacing options, this embedded computer is a gateway for data acquisition and processing at field sites as well as a useful communications platform for many other large-scale deployments. 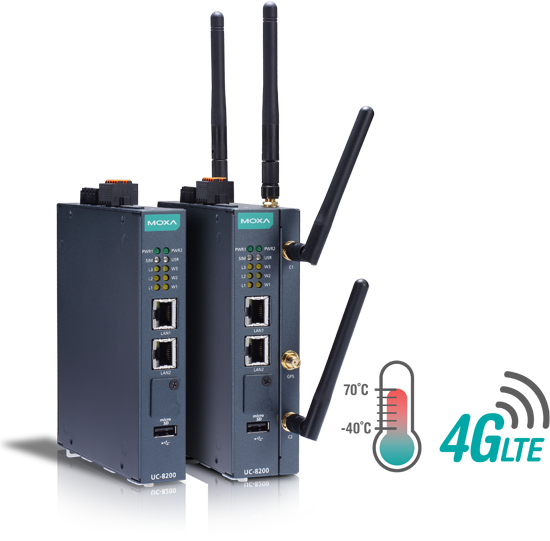 Wide temperature LTE-enabled models are available for extended temperature applications. All units are thoroughly tested in a testing chamber, guaranteeing that the LTE-enabled computing platforms are suitable for wide-temperature applications, said the company.